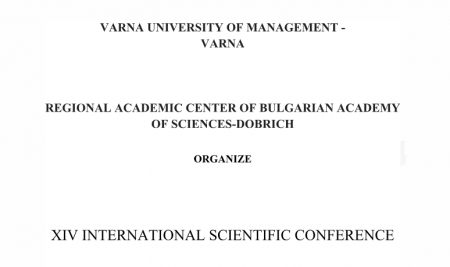 VARNA UNIVERSITY OF MANAGEMENT – VARNA and REGIONAL ACADEMIC CENTER OF BULGARIAN ACADEMY OF SCIENCES-DOBRICH organize XIV INTERNATIONAL SCIENTIFIC CONFERENCE “THE MODERN SCIENCE, BUSINESS AND “EDUCATION, that will take place from 03.07.2018 till 05.07.2018 year in the city of Dobrich. The aim of the conference is to solve together actual theoretical and practical problems in the area of the modern science, business and education. – Manuscripts are accepted only with application request. – All accepted manuscripts will be published on one of the used languages: Bulgarian, English or Russian. Up-to-date information will be provided on the web-site of the Varna University of management- Varna (www.vum.bg). The yearbook with papers will be printed before the conference. – Application request and abstract of the paper: till 15 th April 2018year. – Answer to participate in the conference: till 30 th April 2018year. – Full paper submission: till 31 st May 2018year. – The participation fee is 80 leva. – The volume of the submitted manuscripts should be between 3000 and 5000 words (together with the abstract and list of used literature). – The structure of the main text includes the following sections: Introduction (actual problem), main body (literature review, methodology and results of the study, discussion and conclusion (contribution for the development and perspectives of the studied problem). of the author (Times New Roman, 14 Italic). – In the beginning of the paper is the Abstract and Key words in the language in which the paper will be presented. The Abstract should be in Bulgarian or English no more than 150 words. – The main text format: Times New Roman 12, spacing between lines: 1.15. – Each part should be separated from the previous text with a free line. The authors can place extra separations in the sections. Subtitles should be in в Bold and numbered 1, 1.1., 1.2.1.,etc. – All tables, figures and schemes are placed on the text in their corresponding places and are presented in separate files. They must be numbered consequently. The number of figures and its description should be under them in Times New Roman 10, of the tables – above them in Times New Roman 10. Citation in the text: (Family of the author, year of publishing), for example: (Petrov, 2007, p…. ), (Kotler, 2006, рр….). – Papers – Buhalis, D. (2000). Marketing the competitive destination of the future. Tourism Management, 21(1), 97-116. – Books and monographs – Kotler, P., Haider, D. H. &amp; Rein, I. (1993). Marketing places: Attracting investment, industry and tourism to cities, states and nations. New York: The Free Press. – Chapter in books – Bachvarov, M. (2006). Tourism in Bulgaria. In Hall, D., Smith, M. &amp; Marciszewska, B. (eds.) (2006). Tourism in New Europe. The challenges and opportunities of EU enlargement. Wallingford: CAB International, 241-255. – Conference papers – Ivanov, S. (2013). The price discrimination as instrument for revenue management in the hotel-from theory to practice. Yearbook with papers of the scientific conference &quot;the knowledge traditions,innovations, perspectives&quot;, 14-15 May 2013, Burgas Free University, Burgas, Volume III, pp. 380-385. – Conference presentations – Cooper, A., &amp; Wilson A. (2002). Extending the relevance of TSA research for the UK: general equilibrium and spillover analysis. Presentation at the VIth International Forum on Tourism Statistics, 25th-27th September 2002, Budapest. – The sources are listed at first in Cyrillic, then the ones in Latin. the text and the literature used! Person to contact: Assoc.prof.Silvena Dencheva, Ph.D.